B1 – 6 Clockwise couple make arch, anti-clockwise couple go through, then make their own arch. Clockwise couple go backwards under this arch. 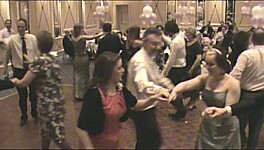 Then make a third arch, and anti-clockwise couple go under it and move forward to meet the next couple. Sounds complicated, but works simply in practice. 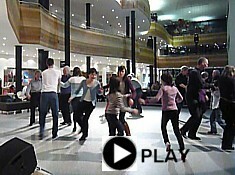 The music starts off slowly, but gains in speed as the dancers become adept in the arches! We suggest sticking to the first tune for 3 or 4 times before moving to the second tune. This makes it easier to speed up the music gradually. 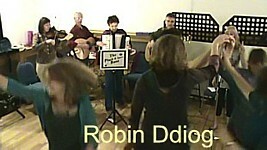 Video Clips of "Robin Ddiog"